Taipei, Sept. 14 (CNA) President Tsai Ing-wen (蔡英文) awarded Morris Chang (張忠謀), founder of Taiwan Semiconductor Manufacturing Co. (TSMC) the Order of the Propitious Clouds, 1st class, Friday. At the ceremony, Tsai said the medal was for the tech guru's contribution to Taiwan's integrated circuit industry as well as the development of the local high tech sector. The Order of the Propitious Clouds is awarded to civil servants who have made great contributions to the country and to civilians and foreigners for outstanding civic merit. Chang is the first person from the business sector to receive the Order of the Propitious Clouds, 1st class, medal. Tsai said she respected Chang very much and considered him a good friend, adding that she often asks him for advice on how to promote national policies and has learned a lot from the TSMC founder. The president noted that Chang brought advanced IC know-how to Taiwan from the United States, where he received a Master's degree from Massachusetts Institute of Technology and a PhD from Stanford University, helping Taiwan build a comprehensive IC industry incorporating upstream and downstream sectors. In 1985, the Taiwanese government recruited Chang to run the Industrial Technology Research Institute (ITRI), a decision that perhaps altered the course of science and technology in Taiwan forever, Tsai said. As head of ITRI, Chang was in charge of promoting industrial and technological development in Taiwan. Being a visionary, he combined his experience working in the semiconductor industry with the rising trend of outsourcing to found TSMC. Since its establishment in 1987, TSMC has become the leading semiconductor foundry in the world, with a current global market share of more than 50 percent. 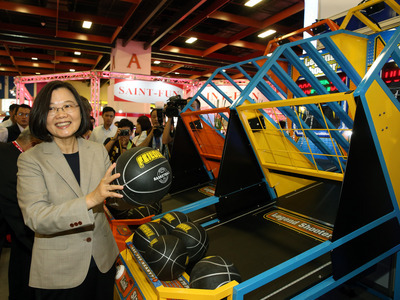 Tsai said TSMC has continually developed critical IC technology in Taiwan, a reference to the company's efforts to develop sophisticated 5 nanometer technology and build a wafer fab in the Southern Taiwan Science Park, which is expected to serve as a hub supplying chips for cloud-computing, artificial intelligence and 5G devices. Addressing the ceremony, Chang, who retired as chairman of TSMC in June after serving the company for more than 30 years, said TSMC, the world's largest contract chipmaker, is a very successfully company, but it also faces stiff competition from several countries such as the U.S., China and Japan, which have been motivated by rising nationalism. Chang said amid escalating nationalism, TSMC needs fair competition in order to grow. In addition to international competition, Chang said the local IC industry also faces a shortage of resources, including land, water, electricity and talent, urging the government to give the tech sector the support it needs to prosper. Chang said he has faith in TSMC's new leadership and expects the company to expand and make more contributions to the country. In June, Mark Liu (劉德音) succeeded Chang as chairman of the company's board and C.C. Wei (魏哲家) serves as TSMC's vice chairman and chief executive officer, establishing a "dual leadership" system.